1. 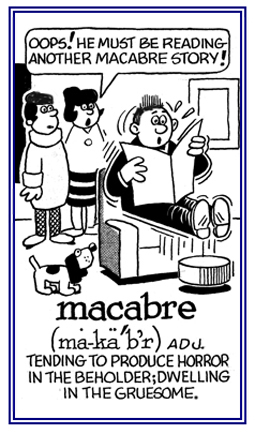 Descriptive of something or someone that is ghastly, gruesome, and horrible: The macabre story shown on TV about headless ghosts frightened Irene's children very much. 2. 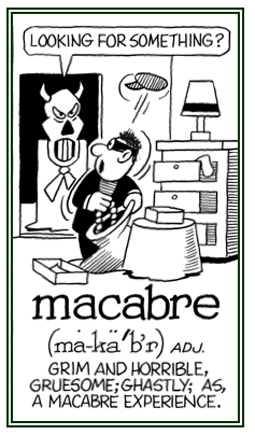 Etymology: from Old French danse macabre, "dance of death"; literally, "dance of the Maccabees". 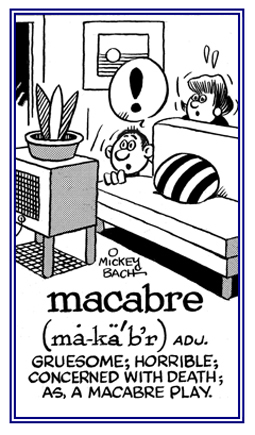 There is much that is macabre in the tale of the Maccabees. © ALL rights are reserved. 1. In a manner that is horrible, gruesome, and to an extreme: The teacher macabrely told tales of wars and plagues which occurred in the Middle Ages. 2. Pertaining to grotesque and horrific details of death and decay: The tornadoes macabrely created devastation for many areas. 3. Constituting or including a representation of death; spine-chilling, repulsive, or ghastly: The book macabrely described the "criminal history of mankind". 1. Characterized as subtle, unscrupulous, self-serving, and dishonest: The prime minister has a Machiavellian scheme to be appointed as the young king's guardian. In his Machiavellian view, it is suggested that a prince should be concerned only with power and be bound only by rules that would lead to success in political activities. As an Italian historian, statesman, and political philosopher; Machiavelli's amoral and Machiavellian writings about political actions have resulted in his name being a synonym for "cunning" and "duplicity". 2. 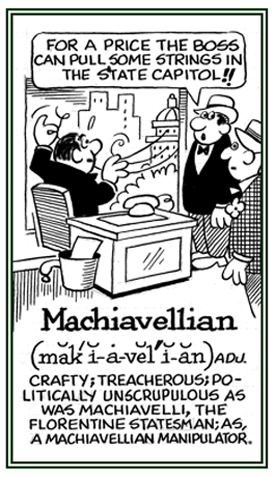 Etymology: from the name of the Florentine diplomat Niccolò Machiavelli (1469-1527) whose book, The Prince, outlined ruthless ways to get and to keep political power. © ALL rights are reserved. To use deceptive actions or methods which are used to get or to achieve something: James tried to machinate a large income by fooling people into believing that their investments in his company would bring them big profits. © ALL rights are reserved. Clever schemes which are typically underhanded, cunning, and destined to accomplish desired purposes: By a series of machinations, one man gained complete control of the business from business partner. © ALL rights are reserved. 1. A device which uses a source of power in order to perform the task for which it was designed: Mary was told that her washing machine needs to be repaired. 2. An organization of individuals dedicated to or committed to working together to achieve a desired end, often with political overtones: The mayor has a political machine working for his reelection. 3. 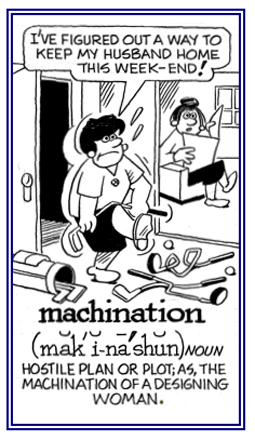 Etymology: such words as, machine, machinery, and machination come from Greek mechane, "device, instrument, means". The same Greek element is the source of mechanical and mechanics. To shape something by using a specifically designed tool: The parts of this engine have been precisely machined to function with other elements of the motor. 1. Mechanical equipment that requires a power source in order to perform the task for which it was designed: The ship's machinery is being overhauled at the dock. 2. The organization or structure of a system that enables the system to function: The teachers are defying the machinery of local government authorities as it relates to school staff evaluations and salaries. 1. The entirety of something that is encompassing the universe: The earth is but a speck in the macrocosm. 2. Etymology: from Greek makros, "great, large" + cosmos, "world, universe", which also includes cosmic, cosmos, and cosmopolitan; "at home anywhere in the world"; as well as, microcosm, literally "little world". 1. Angry; resentful, infuriated: Her haughtiness makes her father mad. 2. Suffering from a disorder of the mind; insane, deranged: Van Gogh is reported to have had periods during which he was completely mad. 3. Marked or described as temporarily experiencing violent emotions, ideas, or behavior: Susanne was mad with jealousy when she saw her boyfriend talking with another girl. 4. Lacking restraint or reason; foolish: Jerome was mad to have hired both of those guys. 5. Foolish, impassioned, or demonstrating a strong attraction to someone or something: Ben's daughter was mad about sports. 6. Marked by extreme excitement, confusion, or agitation: There was a mad scramble for the tickets to the Olympic games. 7. Descriptive of something as amusing, a great deal of fun, hilarious: Dina and Fay had a mad time at the birthday party last night. 8. Affected by rabies; rabid: The neighbors could hear the mad dog howling because of the rabies that it was afflicted with. For decades, language purists have been telling people that mad refers only to "insanity" and that we should not use it to mean "angry". Regardless, mad does mean "angry", and expressions; such as, "I'm mad at him" and "She's mad because she wasn't invited to the party" are considered acceptable usages; although using such terms in formal writing might be considered "too informal and less desirable" than using "angry". 9. 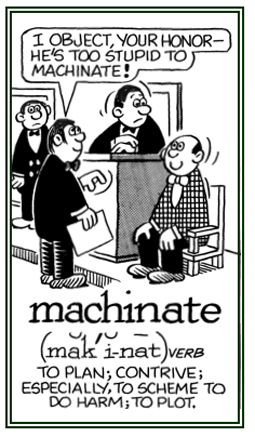 Etymology: the origin of mad is the shortened form of Old English gemad, "insane". 1. To an extreme or excessive degree: The madly ambitious writer almost became seriously ill from his excessive dedication. 2. In an insane manner or action: People were greatly disturbed as the man pulled out a knife and started madly waving it around in a threatening way. 1. A man who has been diagnosed with a severe mental illness: The actress apparently was being stalked by a madman. 2. An informal usage indicating a man or men who behave in a wild and uncontrolled manner: There are madmen who drive recklessly fast on the roads regardless of the speed limits or the numbers of cars. 1. A condition of severe mental illness: The girl's parents suffered a series of tragedies that almost drove them to madness. 2. Behavior or thinking which is very dangerous or foolish: The teenager was thought to be at the height of madness when he was driving so fast through the city streets. A musical passage or movement that is played in a splendid and superb fashion: The concert audience was thrilled by the maestoso that took place during the classical performance. Relating to the majestic or magnificent way music is to be played: The orchestra had to practice the second movement again because the conductor wanted it played maestoso, with a lot of feeling of greatness, and not just legato or smoothly, without any noticeable breaks between the notes.